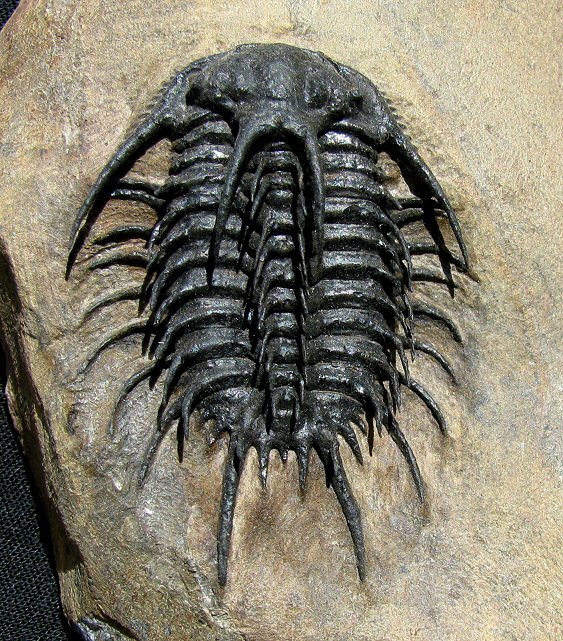 This is one mind-blowing, spiny Moroccan trilobite. This is a phenominal Diacanthaspis sp. from Morocco. This type is strangely similar to the ORDOVICIAN Acidaspis and Diacanthaspis found in the United States. This type is quite sought-after for its extreme spiny features, and this specimen showcases these spines beautifully. There are spines everywhere! This fabulous trilobite has its thick shell preserved - excellent preservation for this layer! The many free-standing spines makes this trilobite very displayable and extremely impressive. And not only is this bug fantastic, it is screamin' rare! This is an incredible, ultra rare trilobite that is one of the best of this type we've ever seen.